I'm a fairly big fan of all their psychadelic artwork, and this piece fits well within the usual style. The lettering of the Jaspers is a little out of touch with the rest of the wavy work, but it mostly has the effect of fitting in with the description, rather than the label art. 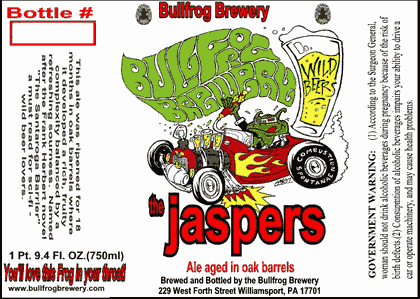 Some people will no doubt have issue with a label that depicts a frog driving while pouring beers in his hot rod. To them, I suggest that amphibians driving drunk is not, probably, a significantly greater danger than amphibians driving while sober.